On this page I have tried to create the ultimate pitstop for people trying to learn and use the OpenSAML library. I'll start out with an introduction to OpenSAML and move on to a some resources that might be of help. I will also introduce my blog post on this subject and my book, A Guide to OpenSAML. Internet2 provides and supports the library. Shibboleth products, produced by internet2, are one of the examples of identity solutions that utilize the OpenSAML library. The OpenSAML library is available in Java and C++, however; not all functions are provided in both versions. OpenSAML is licensed under Apache 2.0 and the latest version of OpenSAML supports SAML 2.0, 1.1 and 1.0. When I work with OpenSAML I try to spend some time to blog about different situation and problems I encounter. Here are some of the more popular. 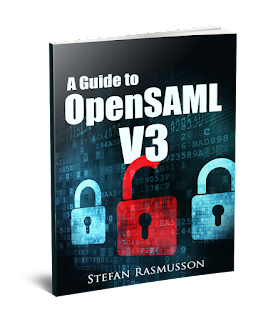 A Guide to OpenSAML is a short book that introduces SAML, the SAML Web Browser Profile and the use of OpenSAML. The book has three parts, the first of which introduces SAML, SAML Web Browser Profile and OpenSAML. The next part goes deeper into explaining the Web Browser Profile more in detail and shows how to implement it using OpenSAML. The last part explains how to use some of the security functions in OpenSAML, like signatures and encryption. Mail lists - The developer list is for OpenSAML discussions. Lots of smart and resourceful people. I have gotten a lot of help from here. Hi Stefan, I've been trying to get any kind of clear instruction on how to create a SAML Response to POST to an SP using an IDP-initiated Single Sign-On structure. I don't have to do much other than generate the response for users to log into Staples Online after authenticating in our application. Obviously there are some details we have to coordinate with them, like giving them our x.509 cert and exchanging valid userIDs and so on. But I'm stuck on how to sign this, and almost every resources I've looked at is confusing and incomplete, or directs me to yet another confusing, incomplete resource. Any help for the resolution of the above error will be appreciated.